Second round: 1. Scott Snedecor, 9.1 seconds, $5,331; 2. Trevor Brazile, 9.9, $4,281; 3. J.P. Wickett, 10.3, $3,231; 4. Tony Reina, 10.6, $2,181; 5. Jason Evans, 11.3, $1,131. Average leaders: 1. Trevor Brazile, 19.7 seconds on two runs; 2. Scott Snedecor, 20.2; 3. Jason Evans, 21.5; 4. Mike Chase, 22.9; 5. J.P. Wickett, 23.1. Fourth round: 1. Jason Evans, 9.5 seconds, $5,331; 2. (tie) Mike Chase and J.P. Wickett, 10.3, $3,756 each; 4. Rocky Patterson, 11.1, $2,181; 5. Jess Tierney, 11.3, $1,131. Average leaders: 1. Trevor Brazile, 43.9 seconds on four runs; 2. Jason Evans, 47.0; 3. Jess Tierney, 48.6; 4. J.P. Wickett, 49.8; 5. Mike Chase, 51.5. Fifth round: 1. Mike Chase, 10.2 seconds, $5,331; 2. Trevor Brazile, 10.3, $4,281; 3. Brodie Poppino, 10.7, $3,231; 4. (tie) J.P. Wickett and Troy Tillard, 10.8, $1,656 each. Average leaders: 1. Trevor Brazile, 54.2 seconds on five runs; 2. J.P. Wickett, 60.6; 3. Mike Chase, 61.7; 4. Jason Evans, 63.5; 5. Jess Tierney, 67.5. Sixth round: 1. Brady Garten, 9.5 seconds, $5,331; 2. Trevor Brazile, 9.6, $4,281; 3. Troy Tillard, 10.1, $3,231; 4. J.P. Wickett, 10.7, $2,181; 5. Cody Lee, 10.8, $1,131. Average leaders: 1. Trevor Brazile, 63.8 seconds on six runs; 2. J.P. Wickett, 71.3; 3. Mike Chase, 74.9; 4. Jason Evans, 77.0; 5. 78.3. Seventh round: 1. Brady Garten, 9.5 seconds; 2. Trevor Brazile, 11.2, $4,281; 3. Tony Reina, 11.7, $3,231; 4. Jess Tierney, 12.5, $2,181; 5. J.P. Wickett, 14.4, $1,131. Average leaders: 1. Trevor Brazile, 75.0 seconds on seven runs; 2. J.P. Wickett, 85.7; 3. Jason Evans, 97.3; 4. Tony Reina, 100.5; 5. Mike Chase, 74.9 seconds on six runs. Eighth round: 1. Brady Garten, 9.8 seconds, $5,331; 2. Rocky Patterson, 10.8, $4,281; 3. Chance Kelton, 10.9, $3,231; 4. Cody Lee, 12.1, $2,181; 5. (tie) Mike Chase and Brodie Poppino, 12.4, $565 each. Average leaders: 1. Trevor Brazile, 89.5 seconds on eight runs; 2. J.P. Wickett, 99.4; 3. Tony Reina, 114.4; 4. Mike Chase, 87.3 seconds on seven runs; 5. Chance Kelton, 96.0. Ninth round: 1. Scott Snedecor, 9.9 seconds, $5,331; 2. Jason Evans, 10.1, $4,281; 3. Cody Lee, 10.8, $3,231; 4. J.P. Wickett, 10.9, $2,181; 5. Chance Kelton, 11.3, $1,131. Average leaders: 1. 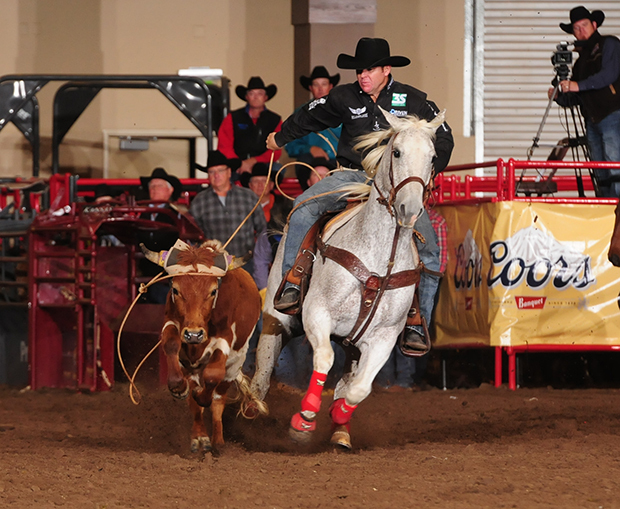 Trevor Brazile, 103.6 seconds on nine runs; 2. J.P. Wickett, 110.3; 3. Tony Reina, 133.9; 4. Chance Kelton, 107.3 seconds on nine runs; 5. Jason Evans, 107.4. Tenth round: 1. Vin Fisher Jr., 9.6 seconds, $5,331; 2. Chet Herren, 9.7, $4,281; 3. Brady Garten, 9.9, $3,231; 4. Ricky Patterson, 10.2, $2,181; 5. Trevor Brazile, 10.5, $1,131. Average: 1. Trevor Brazile, 114.1 seconds on 10 runs, $15,992; 2. J.P. Wickett, 126.3, $12,842; 3. Chance Kelton, 120.4 seconds on nine runs, $9,692; 4. Jason Evans, 121.3, $6,542; 5. Tony Reina, 133.9, $3,392. Total NFSR money: 1. Trevor Brazile, $43,858; 2. $26,977; 3. Jason Evans, $20,515; 4. Brady Garten, $19,223; 5. Scott Snedecor, $17,123. Final world standings: 1. Trevor Brazile, $112,692; 2. Chet Herren, $72,191; 3. J.P. Wickett, $60,017; 4. Jess Tierney, $58,003; 5. Vin Fisher Jr., $56,341; 6. Jason Evans, $55,739; 7. Cody Lee, $51,957; 8. Brady Garten, $41,766; 9. Chance Kelton, $51,517; 10. Scott Snedecor, $48,348; 11. Rocky Patterson, $43,152; 12. Mike Chase, $42,932; 13. Tony Reina, $41,969; 14. Brodie Poppino, $26,170; 15. Troy Tillard, $33,155.